Similar to the earlier models in having the full keyboard and using cold-cathode tube technology, but with decimal and Sterling currency (£sd) capability. 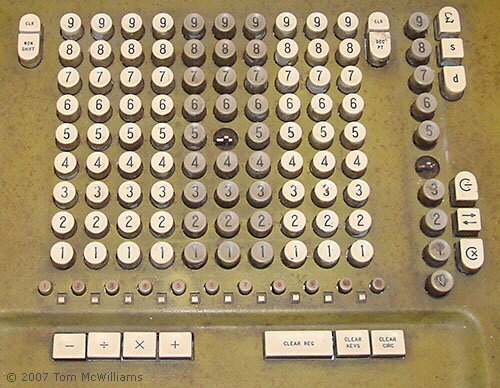 The Mk 10 is virtualy identical to the Mk 9 except that it includes three extra keys on top right hand side for direct pounds/shillings/pence (£sd) conversion, and modified electronics to perform this extra function. Britain changed from the £sd to decimal currency on 15th February 1971, so this machine would have been most useful to that date. This model is still a decimal machine at heart. It does not have full Sterling capability - The operator has to choose whether the input will be in £ (pounds) s (shillings) or d (pence). Values are then input in decimals of that unit. The result can be displayed in full £sd sterling or in the decimal equivalent. "The Mk. 10 is a desk-top calculator with a full keyboard and simple controls. It has a facility of value in a department where, for the time being, many of the problems involve sterling calculations. 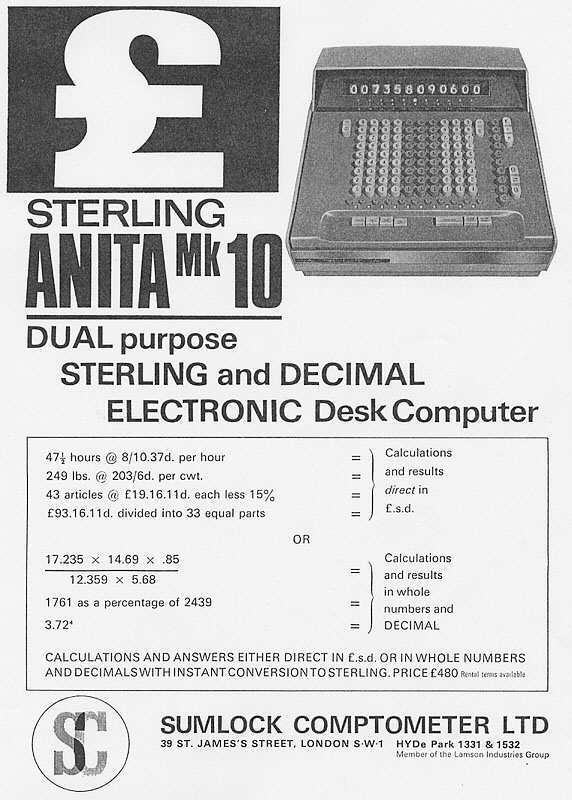 The Anita will accept entries in either £ s. d. or decimals and, although the results of its calculations appear on the display register in decimal form, a touch on a conversion key will change them instantly to £ s. d. The machine can be instructed to work in decimals of a pound, a shilling or a penny, the base used being selected according to the nature of the problem. For example, when dealing with a number of prices which are all in pence or shillings, in a calculation likely to provide an answer in the same range, working in decimals of a pound could be inconvenient." Close up of the keyboard of the ANITA Mk 10. Here the keyboard has been hinged forwards to reveal the electronics inside the Mk 10. The design is similar to that of the ANITA Mk 8. There are two horizontal boards at the bottom of the casing. 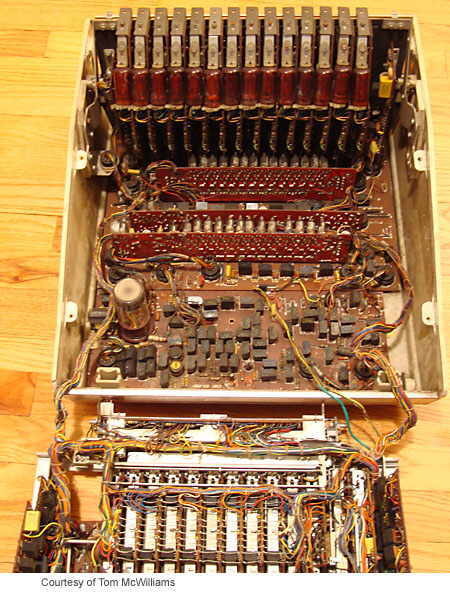 The front board carries the Dekatron counter tube, on the left, and the rear board holds three daughter boards, all using cold-cathode switching tubes. 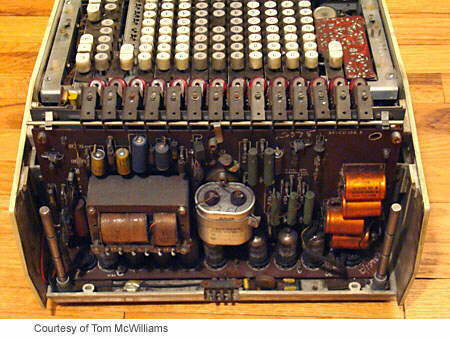 Along the top of the photograph is the line of numerical display tubes, each clamped to the edge of a board carrying driver and counter electronics. At the rear is the power supply cicuitry and several vacuum tubes (electronic valves). Advertisement showing the £ s d keys, at top right. "ANITA Mk. 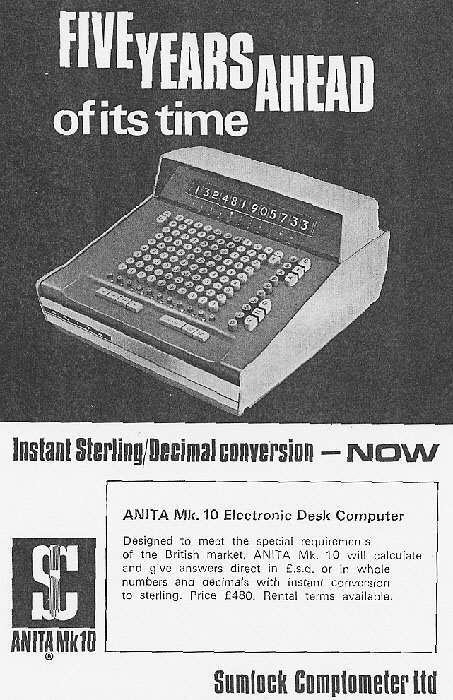 10 Electronic Desk Computer"
"Designed to meet the special requirements of the British market, ANITA Mk. 10 will calculate and give answers direct in £.s.d. or in whole numbers and decimals with instant conversion to sterling. Price £480 [GBP, about US$1300]. Rental terms available." Advertised as "5 years ahead of it time" because the conversion from Sterling £sd to decimal currency in Britain was then 5 years away (actually on 15th. February 1971). 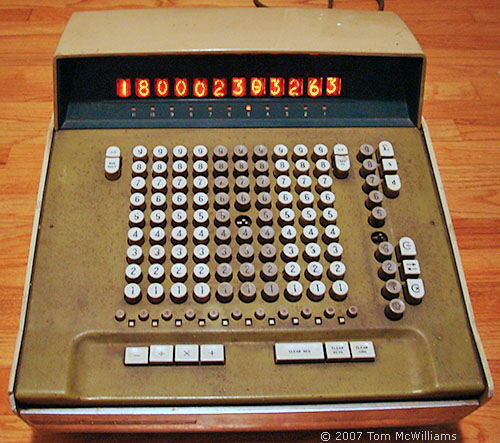 This is the only known electronic calculator with a Sterling £sd capability. 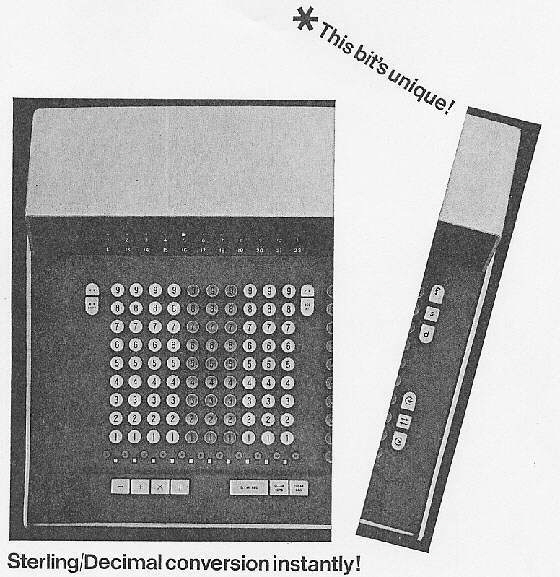 See the Sterling Currency Section of the Vintage Calculators site for further details of mechanical Sterling calculators. "BEE [Business Efficiency Exhibition]", Office Methods and Machines, October 1965, p779. "Self-Service Arithmetic", Office Methods and Machines, June 1968, pp14-15.